If you notice that you are starting to find dark spots on your skin, not to mention your whole face is also turning darker, there is one solution—a skin lightener. Over the years, these kinds of products have occupied the markets for people, especially women, to achieve great skin. But not all skin-whitening products want what is best for you. Some could just destroy your face and leave long-term damage. So with that, one thing to remember is to avoid using skin bleaches or harsh chemicals if you want to have a lighter complexion. Choose your facial scrub carefully. And for a safe start, why don’t you try the Vi-Tae ‘Get Refreshed!’ Skin Whitening Facial Scrub? 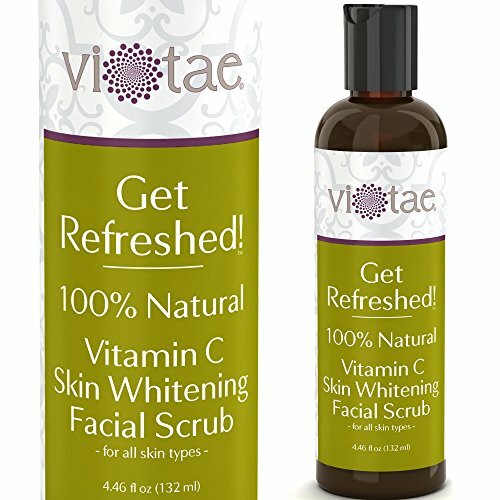 The Vi-Tae ‘Get Refreshed!’ Skin Whitening Facial Scrub is the product your face will thank you for! No need to head to the clinic because you can safely get lighter skin at home. This facial scrub has a special blend that is totally safe and easy to use, while still offering amazing results. That is because its ingredients are all natural, such as strawberry, mushroom, and licorice root extract that all work together to prevent the production of melanin, and to lighten your skin when regularly used. It is also rich in vitamins C and A that make those difficult-to-treat age spots fade. In addition, it has bearberry and pomegranate that both fight free radicals that cause hyperpigmentation. It nourishes the skin as well as aids in achieving a truly glowing complexion. And with the added Jojoba and volcanic ash, this product is able to cleanse pores and gently exfoliate to keep your skin soft and agile. For best results, use this product once a week to exfoliate your skin after cleansing your face. Apply it to your face and neck, and add a bit of water. Make sure you avoid your eyes as you wash your face in circular motions for about one to three minutes (the longer you leave it on your face, the better it works). Then, rinse with warm water or remove it with a washcloth. Apply moisturizer or treatment product after. Moreover, you will surely want to use this product on your face since it smells divine, and provides an all-natural feeling. The little face cleaning silt grains will convince you that it can really do the job it is supposed to do. Likewise, if you are a prudent user, small amounts do go a long way so you can be certain that this bottle will last for quite a while. And why wouldn’t you like that? You want to feel as refreshed as you can after every use of this facial wash. It can easily be rinsed off, unlike other facial products that leave your skin feeling oily even after washing it off. Some were not fans of this product because of its smell as they feel it is too strong. Others also thought it was overpriced. One user also reported that it burned her face each time she used it. Another said that it made her skin feel smoother, but failed to make it lighter and feel refreshed. Incidents of rashes and skin break outs were also said to have occurred because of this product. Other than that, this product is a winner. The Vi-Tae ‘Get Refreshed!’ Skin Whitening Facial Scrub is definitely recommendable because it brings out fantastic results while being safe for all skin types; it deserves a spot in your bathroom. It is as effective (or even more) as those artificial face products out there, and since it is an all-natural facial scrub, you can be confident that it will not harm your skin. It is loaded with antioxidants and vitamins that help brighten and lighten your complexion. Plus, it makes dark spots fade with gentle exfoliation. It cleanses your skin to keep it glowing and young looking. No doubt, this product is your ticket to having the skin you can be proud to show to everyone!